Fall is in the air for so many of our readers! 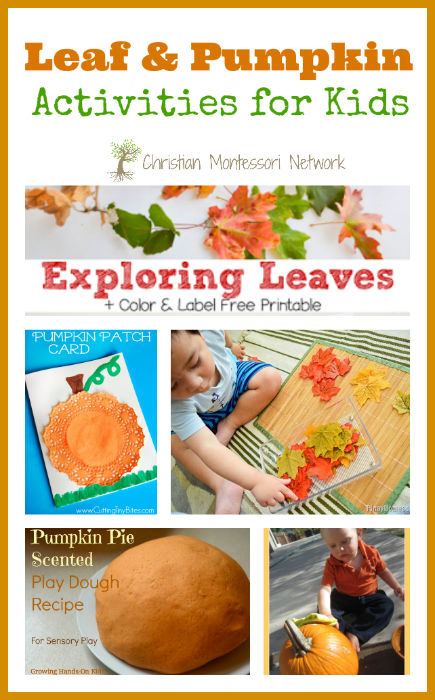 After last week’s Autumn Printables post, we thought we would continue the Autumn celebration with fun leaf and pumpkin activities we know your kids will love! We cordially invite you to our Community Open House and Back to School Night Monday September 25th from 4:00 – 8:00 pm. Come meet our Montessori Staff, Learn about our Organic Living Program, Children’s Music Conservatory Program and see why Montessori at St. Matthew’s Montessori School is right for your child! St. Matthew’s Montessori School is located at 2300 Ford Road in Newport Beach, Ca 92660. We are your Newport Coast, Port Streets and Spyglass Hill Neighborhood Montessori School and look forward to meeting you! Can’t make it, no worries, schedule a tour by calling (949) 219-0915 today! The discussion of authentic Montessori is a widely complex topic; we must consider a classroom’s prepared environment, materials, qualified teachers, uninterrupted time, and the social/academic structure of the class. Throw into the mix the difference between private and public schools and there are two parallel conversations with relation to school accountability and child assessment. As if that were not complex enough, there are Montessori schools of different age levels, from infant/toddler-high school. Because “Montessori” is not trademarked there are even Montessori schools that bare the name and practice only a shade of Maria Montessori’s original programming. The specifics of importance are as varied as the source they come from. So what is important when defining authentic Montessori? Montessori designed her schools to be places of intrinsically motivated learning fueled by structure of a functioning ecosystem of independent co-learners where a “Child exhibited a ‘love of work’ and began to concentrate contentedly for a long time” (Pickering, 2012, p. 9). This unique atmosphere developed fine motor skills, gross motor skills, practices of grace and courtesy, and ownership of one’s learning environment. This translated into care of the natural world and peace in symbiotically relating to both others, and the world. Hot topics in today’s debates on authenticity tend to narrow heavily on specifics found in the modern Montessori classroom: technology, non-wooden/traditional materials, and workbooks, for example. Most private and public Montessori educators would agree on the importance of trained Montessori staff and extended work periods to allow children uninterrupted focus (American Montessori Society, 2015). When discussing modern authenticity, public and private sectors have both shared and unique characteristics that are of great value to their programming. Private schools want to maintain the authenticity of Montessori especially within the ages and demographic of which they serve. Public schools hold different legislative accountability that must be kept on primary radar. Public schools are also in a modern crisis; American students are performing low in the areas of math and science. This is a problem because, while projected future jobs rely heavily on skills in these areas, the pendulum continues to swing from unstructured to constrictive test-driven action plans (Powell, 2009). According to the National Science Board’s 2010 Report, job growth in the realms of technology, science, mathematics, and engineering industries have more than tripled compared to other fields in the last decade with a continual rise. Beyond that, jobs in these areas earn 26% more than others annually. The Science Board’s report is describing what children need for today’s world; did not Montessori call for “Education for Life” – education for these children, in this world, at this time. When envisioning how our students can make a difference in our country and across the globe, we need future American leaders in this booming arena. One of the report’s recommendations was to identify students that are strong in math and science at the earliest age possible. How else are we to identify strong science and technological strengths at an early age if we allow no technology in the classroom? Is splitting hairs over technology and no plastics in the classroom really following the child where they are at in today’s world as Montessori would have done? Or, is it in fact clinging to the first model (which she originally set up in order to give structure to following the child)? Challenges to constructively singling out one true methodology of practice in Montessori is challenging within varying levels, accountability structures, and professional affiliations. Each type of Montessori school has immediate needs. Many modern Montessorians are incredibly concerned with technology and workbooks quietly undermining Montessori best practice. These resources (as well as plastic as a work material) were not available to Montessori and so were not incorporated into her educational model. Many educators are covering vast fields of current research to determine educational benefits. Some feel that simplifying the classroom without modern distractions allows for greater child focus (Pickering, 2012). Others find use for modern materials such as workbooks within context of age and need for physical material to move from concrete to abstract (Caldwell, 2007). In the modern discussion of Montessori it is important to emphasize one thing: continued education. Holding fast to the fundamentals Maria designed 100 years ago: scientifically follow the child and see where they lead you. We can research technology, plastic, workbooks, and politics in testing, but what is benefitting the children the most? We should conduct studies within schools nationwide and take data on student achievement to then compare demographically. Children respond well to the controlled continual experiment? Follow them there. While I do not advocate a nation-wide free-for-all, I believe that AMS and AMI should annually publish what is working best for children today, and encourage every Montessori school to implement that practice. This would then ensure consistency from school to school which, as Jerry Abraham (2012) notes, will help Montessori “distinguish itself from other programs” (p. 25). Authenticity matters because it was the basic groundwork of all of Montessori’s study. Scientifically following the child where they are at leads to greater refining of the program, which then leads to increasing student gains. In the electronic publication Questions to Consider: “Montessori, Learning for Life” Marvin Oka (2002) emphasizes that young adults entering the workforce today can be expected to have five to seven career changes. 70% of those jobs have not yet been created. For this future generation the art, in essence, is to continually learn, and love to do so. The non-negotiable aspects of Montessori, are backed by fundamental research, uninterrupted time, leveled independent materials, qualified staff, respect of the child, and following children’s needs. In 2015 we need to remember that Maria’s first Children’s House was run in 1907, and even she changed some things as she organically observed the children (Dorer, 2008). Let us as educators continue to educate ourselves and study children at their individual level. Abraham, J. (2012, Spring). How much water can you add and still call it lemonade? Montessori Life, 22-25. American Montessori Society, Annie Fisher Montessori Magnet School maintaining authenticity amid the press for student achievement. (2012, January 1). Retrieved January 1, 2015. Blessington, J. (2010). Deconstructing Montessori: a growing problem. Montessori Life, 16(4), 36-37. Caldwell, S. (2007, July). Workbooks? Is there a place for them in authentic montessori education? IMC-ENEWS, 18-20. Dorer, M. J. (2008). Authentic Montessori. Streaming Media Recording. St. Paul, MN: The College of St. Catherine. Dowie, Paul (2002). Montessori, learning for life. Streaming Media Recording, Documentary. Hubbell, E. R. (2006). Authenticity and technology in Montessori education. Montessori Life, 18(2), 16-20. Huxel, A. C. (2013, Summer). Authentic Montessori: the teacher makes the difference. Montessori Life, 32-34. Monson, M. (2006). Reconstructing Montessori: on being an authentic Montessori school. Montessori Life, 18(2), 36-36. Pickering, A. (2012 November). The importance of uninterrupted time. Montessori Voices, 9-13. Powell, M. (2009) Is Montessori ready for the Obama generation? Montessori Life, 18-28.